Tis the season to barbeque! The warm weather is finally here to stay for a bit and that means no more being cooped up, cooking in the kitchen. It’s time to uncover the grill, break out your favorite sauces, and throw those meats on to sear! From cooking to cleaning, here are 9 ways to hack your grill this summer! 1. Use ice or butter to make juicier burgers. Use your thumb to make a small indentation in the center of your burger and then add a few chips of ice or a small slice of butter to this center dimple. The ice or butter will keep your burger from drying out while it cooks, and the butter will add a touch of flavor! 2. Add handles to your grill grate. It’s crazy that more people don’t do this super easy and convenient grill hack, especially those who grill often throughout the year. All you need is a few pieces of hardware from the hardware store and you can easily add handles to your grill grate, making it one-hundred times easier to lift the grate in and out of the grill when needed. 3. Turn your grill into a smoker. This hack is a little more detailed, but still totally worth it in the end. No matter what type of grill you have - charcoal or gas - start by soaking your wood chips in water for at least two hours, and filling aluminum drip pans halfway with water. If you have a charcoal grill, remove the cooking grate and place the water pans on one side of the charcoal grate. On the other side of the charcoal grate, arrange your coals and light them. 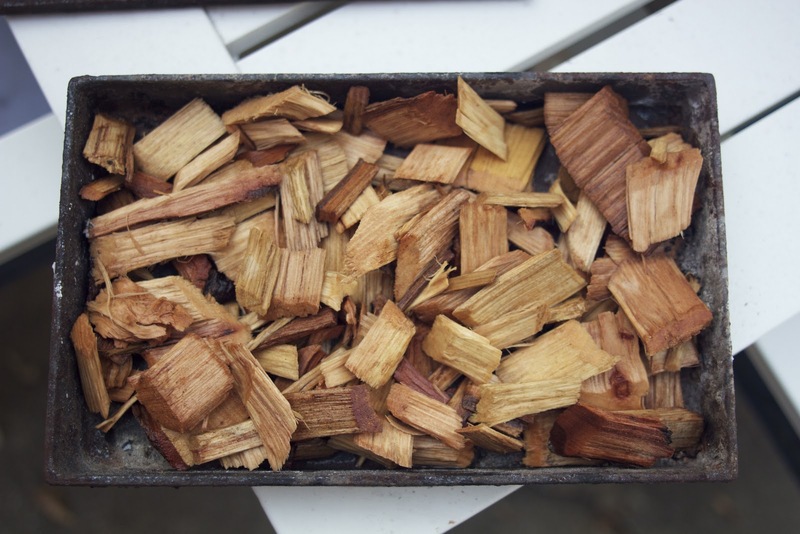 Once they’re hot, add your wood chips directly on top of the coals to create smoke. Replace your cooking grate and add your food over the water pans. If you have a gas grill, remove the cooking grate and place the water pans directly on the front half of the flavor bars that came with your grill. Fill a few small drip pans with wood chips and place them on the back half of the flavor bars. Replace the cooking grate and light the far-back burner where the wood chips are to make smoke. Once the grill reaches your desired temperature, add the food to the cooking grate above the water pans. In both cases - charcoal and gas - and keep the grill covered at all times, except to rotate food or add more chips or charcoal. 4. Grease your grate before adding food. You’re probably already familiar with greasing your pans before adding food to them while cooking in the kitchen, but did you know that it’s also a good idea to grease your grate before grilling? This not only keeps your food from sticking to the grate, but it also helps to cook the food. Consider using a flavored oil to give your food a bit of extra taste-value as well! 5. Spray your meat with apple juice as it cooks. Periodically spraying your meat with 100% apple juice while it cooks on the grill will improve its color, increase its tenderness, and perfect its flavor. Although this is a great trick for any meat, it works particularly well when grilling pork. 6. Check your level of propane with hot water. Not sure if you have enough propane left in the tank to grill dinner tonight, and don’t have a scale to weigh the tank? Don’t worry, there’s a super easy way to check! All you have to do is boil some water, slightly tilt the propane tank, and pour the hot water over the side of it. Place your hand on the side of the tank where you poured the water. Wherever the tank feels cooler, that’s where the propane is! 7. Clean your grill with aluminum foil… or onions! If you don’t have a grill brush, cleaning your grill with aluminum foil works just as well. 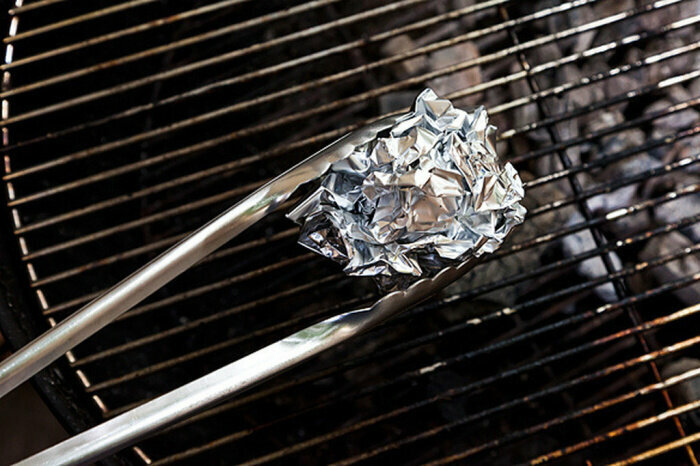 Make a ball out of the foil, hold it tight with a pair of tongs, and scrub your grill while it’s still hot, just like you would with a regular grill brush. You can also use a halved onion. Just stick the onion half on a fork and use the cut side to scrub the grate while it’s still hot. The oils in the onion really get your grill clean, while adding a little extra flavor for your next meal as well! 8. Perfect your fish-grilling technique. There are two awesome hacks for grilling fish. One is to cook fish on top of lemons to keep it from sticking to the grill grate. Unfortunately, no amount of oil seems to keep fish from sticking to the grate, but luckily, lemons are the perfect alternative. Not only will they keep your fish from sticking, but they’ll also add some yummy lemon flavor to your meal! The second hack is to brine your fish to keep it from falling apart on the grill. Simply mix 1 tbsp of salt with 4 cups of water and let the fish sit in this mixture for 10 minutes. Then just pat the fish dry and get to grilling! This last hack is another extremely simple one. Stick your hotdog on a skewer and roll it as you cut it in order to get the spiral cut. This allows the hotdogs to cook more evenly without curling up like they tend to do otherwise. They also have more crevices to hold flavor and condiments this way. Plus, they just look cool! 10. Poach your sausages before grilling for a perfect char. If you love that smokey flavor and a juicy bite of sausage, here's what you need to do. Poach your sausages before you plae them onto the grill so your sausages aren't sitting on the grill for too long while you wait for them to cook. This cooks them perfectly throughout while also giving you the nice crunchy char on the outside. The inside retains more moisture so your sausage will be juicier.